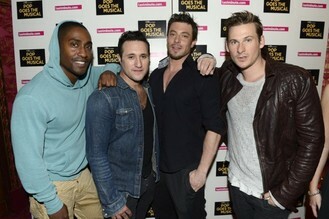 The quartet – Antony Costa, Duncan James, Lee Ryan and Simon Webbe – said they will continue making music and touring, amidst claims they have parted ways with Sony, less than a year after they were signed. The group, who are best known for hits such as All Rise, One Love and Too Close and are about to embark on a world tour, wrote a letter to their fans on Facebook. They said: “It’s hard to believe but after fourteen years, five studio albums, sixteen million sold albums and over 40 #1′s worldwide we still love doing what we do. The feeling doesn’t get any better. This is what we do and we couldn’t do it without you. Blue – who represented the UK at the Eurovision Song Contest in 2011 and appeared on ITV2′s The Big Reunion in 2013 – released their fifth album, Colours, in March. It reached the 13th spot in the UK charts. The band’s spokesman told the Daily Mirror: “Blue and Sony remain on good terms. After the boys finish on their sell-out tour they will be back in the recording studio.